Bonus codes in this series (mask) -DRT4 can be used only 1 time for one account. 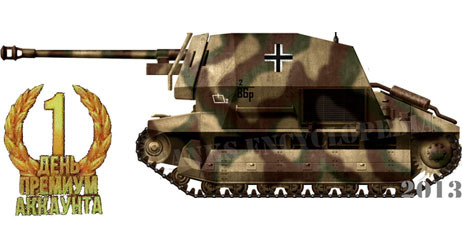 After activating the bonus code on the FCM 36 Pak 40, equipment remains in your account permanently! This product is intended for distribution in Russia and CIS countries. Instructions on how to activate the bonus code:1. After the acquisition bonus code, you have to go to the official website http://worldoftanks.ru/Log in or create an account.2. Go to "My Account".3. Enter the bonus code and thus carry out the activation code.4. If the activation code you received the message: "Invalid code" - Check if you have copied the wrong code or copied with spaces and other special symbols.5. If the code is copied correctly, but the message "Invalid code" repeats, please visit World of Warplanes http://worldofwarplanes.ru/ log in and repeat the activation code.Note - sometimes due to engineering works or failure on servers Wargaming bonus codes are not taken correctly. Reactivate later. In this case, the bonus code can not be returned!